I thought this headline was original when I wrote it. Six hours later, I saw the first copy of USA Today, and my jaw dropped to the floor. Since President Bush's televised address about the economy Wednesday night, The Associated Press has been referring to the White House summit he arranged as an "extraordinary" event. So it's no wonder that most newspapers treated it as such Friday morning, when they printed stories about the meeting and negotiations on Capitol Hill for a $700 billion economic bailout package. And the headlines that those news outlets used to describe what was happening also were quite in agreement. Sixteen newspapers used "Deal or no deal?" to express how political leaders led the public to believe they were close to a deal, but later on, said the talks had collapsed. Four of those were Florida papers in Miami, Orlando, Ocala and Melbourne. Some papers had variations on the headline. The Rocky Mountain News inserted a handy comma after the first "deal," creating a natural pause. But, interestingly, the Sun Herald in Biloxi, Miss., omitted the question mark. I would think it's necessary in such a headline. But 41 newspapers, according to my survey of front pages on display on the Newseum's Web site, used some form of "breakdown," "break down" or "breaks down" as their headline for the bailout package. What this sameness indicates to me is a sameness in today's news reporting. 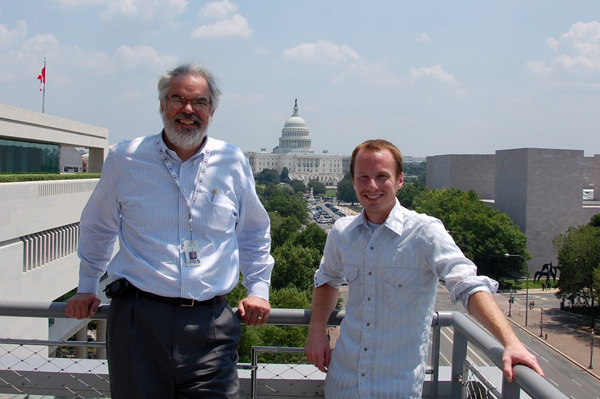 For the past several years, newspapers have been eliminating their bureaus in Washington, D.C. So, with most newspapers depending on their corporate wire services - such as Gannett News Service or McClatchy Tribune Information Services - along with the AP, many stories coming out of this summit were the same and, naturally, a similar headline came from the copy editors reading the stories. Relying on a single news service eliminates the likelihood that off-beat stories and more unique headlines would arise from this historic occasion. FLORIDA TODAY was not immune to this, of course. We've been relying on the AP for much of our copy throughout this economic debacle. During late-breaking news situations, the AP is especially good at running stories early so we can make deadline. I was charged with designing the front page for the bailout summit package. Usually, I would design around the art, but the photos coming from Washington have been particularly ho-hum during this crisis. Bush, Nancy Pelosi and Roy Blunt aren't very high on the sexiness meter. So, with this package, I first thought of a headline that came naturally from the story, which had this lede: "A Republican revolt stalled urgent efforts to lash together a national economic rescue plan Thursday, a chaotic turnaround on a day that had seemed headed for a success that President Bush, both political parties and their presidential candidates could celebrate at an extraordinary White House meeting." And I had it on the page early: 6:30 p.m., about five hours before deadline. After a scurry toward the finish (deadline), I took a sigh of relief that the page was sent to the press. But about an hour later, my heart jumped again. 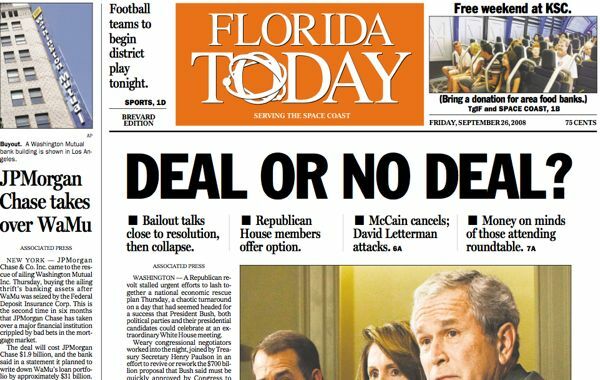 That's when one of the pre-press workers came out with a copy of FLORIDA TODAY and an edition of USA Today, which is printed in Melbourne, too. Both had the same headline. Does this mean that both newspapers covered the news the way it should have been - straightforwardly? Or does it mean that all media are blending into one giant entity, creating little need to pay attention to more than one news source? 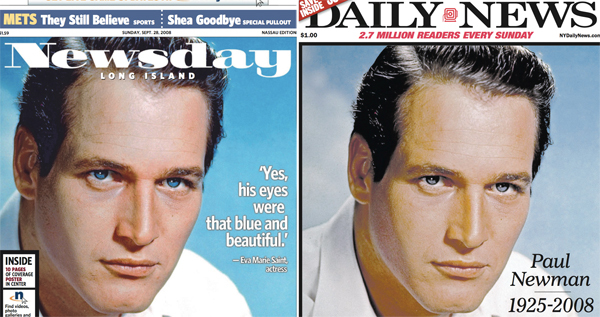 It used to be that you could read two different newspapers about the same topic and get two antithetical stories. Is that a bygone era? If I could do it all again, I still would probably choose the "Deal or no deal?" headline. It's more engaging for the reader than "Bailout breaks down" or "Bailout stalls," another word used widely Friday. Update: Executive Editor Bob Stover writes a column that mentions the headline issue and asks similar questions: Cliche? Appropriate? I created a few galleries with the 16 and 41 headlines. 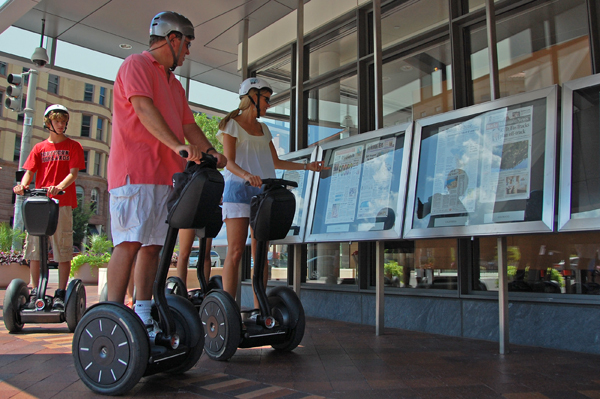 Segway-equipped tourists browse the daily front pages - one from each state - posted in front of the Newseum each morning. I went to the Newseum's restroom, a place with shiny tiles on the walls that said things like "Asteroid Nearly Misses Earth." It was a newspaper headline likely botched by a copy editor who didn't know that "nearly misses" means it didn't miss. It was a second-day story about the end of the world. When someone outside the media realm asks me what I do, I say I'm a journalist. If I have time for a conversation, I say I'm an editor. If there are La-Z-Boys and coffee nearby, I sit down, take a gulp and explain what I really do as a copy editor. Copy editors are superhuman. They're supposed to catch the asteroid before it hits Earth. But because many people outside the world of newspapers don't understand what we do, I should ask: If copy editors ever go away, will anyone notice? 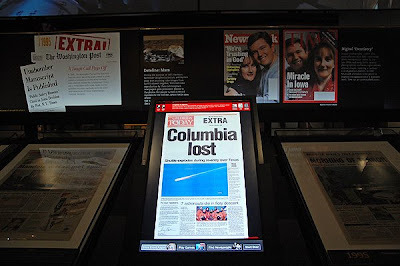 Lawrence Downes of The New York Times says no, as manifest in his trip to Washington's Newseum, a museum of news and journalism that lacks - by name, at least - a copy editing exhibit. In June, he wrote "In a Changing World of News, an Elegy for Copy Editors," an editorial that stirred ire among "testy" copy editors. They felt slighted that their jobs are becoming less significant in the Internet's get-it-right-first, no-time-for-picky-editing news cycle. "Copy editors are being bought out or forced out; they are dying and not being replaced," he wrote. Because copy editing isn't represented at the Newseum, it's obviously being forgotten. "I thanked Lawrence for making me feel completely hopeless," Phillip Blanchard, who worked at The Washington Post until he got bought out, said on his Web site, TestyCopyEditors.org. Downes and I received some of the greatest training possible for copy editors. We both went through the Dow Jones Newspaper Fund's training program and were taught by Ed Trayes, a co-founder of the fund, at Temple University. We both interned at Newsday. We both know the value of copy editing, the phenomenon Downes says is taking its last breath. "I’m still an editor at heart," he wrote in a post this week on Trayes' blog. "Editors - copy editors in particular - are underappreciated and overabused." In just a year of full-time work as a copy editor, I could not agree more. We rarely get credit for our work unless we design a sterling newspaper page or write an award-winning headline. We toil when most people are sleeping. And it's the work that doesn't appear in the newspaper that is our best: stories we have spiked, sparing plagiarism from print; misspelled names we have changed, skirting an embarrassing correction; libel we have caught, avoiding millions in legal penalties; headlines we have tweaked, preventing the end of the world. Like Downes, I went to the Newseum. But I saw something different. In each display - the 383 memorable front pages, the historic mistakes, the prize-winning stories - I saw something that reminded me of what I do every day. As I browsed, I thought: I could have improved that headline; I would not have made that error; there were copy editors behind that Pulitzer. But I was especially proud when I went to the restroom. On the wall were headlines - likely written by copy editors - that should have never been published: "Panda Lectures at Zoo" (always knew they were smart); "Woman Found Dead in Trunk Kept to Herself, Neighbors Say" (obviously); "Actor Sent to Jail for Not Finishing Sentence" (should happen to reporters, too); and, as mentioned, "Asteroid Nearly Misses Earth" (a New York Times story that the Daily News is undoubtedly mad that it overlooked). As do our triumphs, our screw-ups show our value. But the fundamental issue is not whether a museum of news shows copy editors' part in history. It is not whether copy editors will matter in the future. The question all journalists - reporters, photographers, copy editors - should ask themselves is this: Are we all, because of our traditional beliefs, becoming extinct? This "webby" focus and inability to "generate Google hits" with traditional methods - which Downes says are diminishing the copy editor's role - are doing the same to the reporter, the photographer and the editorial writer. At most newspapers, copy editors don't have time to sit down and edit a story for an hour. But at all newspapers, most reporters don't have time to sit down and write a story for an hour. The Web has changed copy editors no more than it has changed reporters. 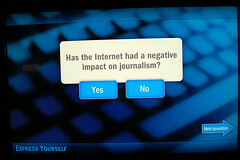 The most interesting exhibit I saw in the Newseum foreshadows all journalists' futures. It was about social media, the ability of everyone - including the people who have never heard of a "copy editor" - to make and produce news and to disseminate their opinions. So if copy editors were wiped from the Earth, would anyone notice? 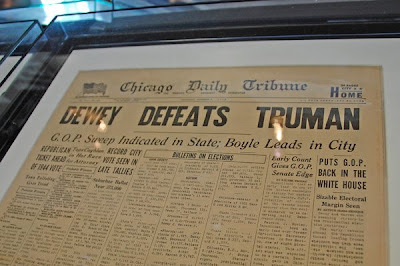 People noticed "Dewey Defeats Truman." They noticed Jayson Blair. They noticed New York Times v. Sullivan. 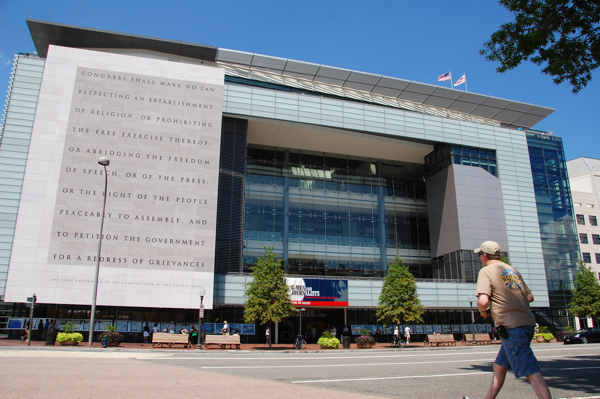 If Downes' death knell rings true for all newspaper journalists, not just copy editors, the Newseum will have to dedicate more than just a restroom to the historic blunders of news. It will mean the end of the world every day. 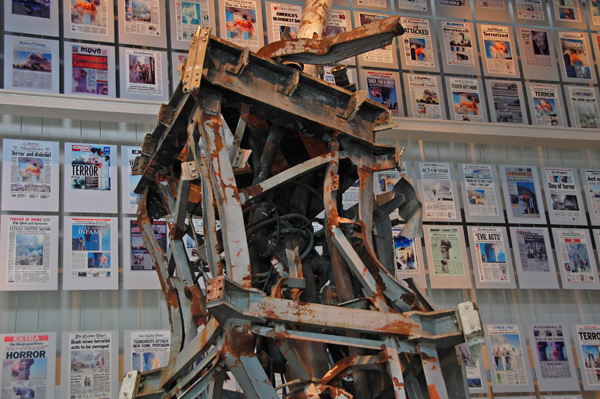 Copy editors touched each one of those pages from Sept. 12, 2001, behind the antenna mast from the North Tower of the World Trade Center. The Newseum could use a copy editor. 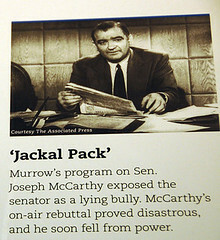 The Edward R. Murrow exhibit gives the CBS broadcaster credit for exposing Joseph McCarthy as "a lying bully." Murrow wasn't even close to being the first one to attack McCarthy. He simply used newspapers to show the evidence against him. Far from groundbreaking. 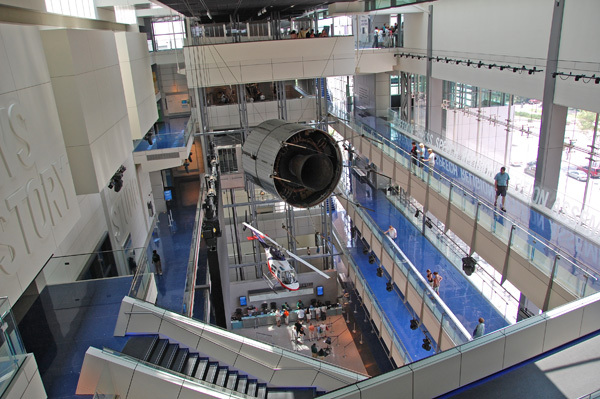 The heart of the Newseum features a replica of a communications satellite. 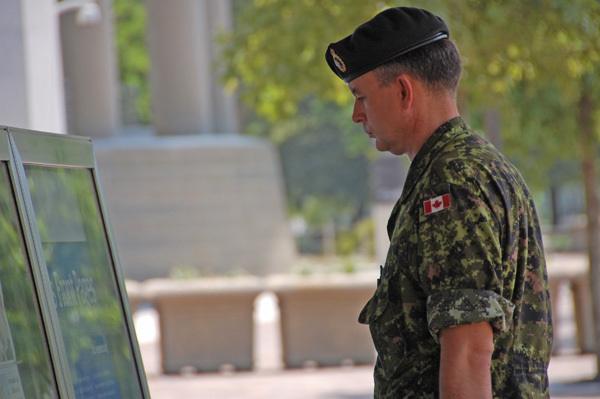 A Canadian soldier looks at the international section of the day's front pages in front of the Newseum. The Canadian Embassy is next door. 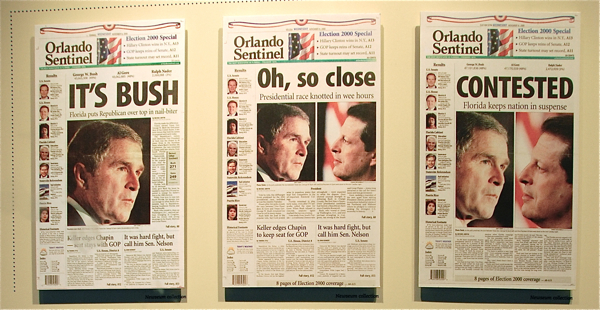 A trilogy of headlines all from the same night in 2000. W. Joseph Campbell, a professor of mine, wrote most of the captions for the 383 historic front pages featured at the Newseum. Hulk Hogan, 55, readies for a kiss from girlfriend Jennifer McDaniel, 20 something. FormerInactive professional wrestler John Cena downs a beer, kept cold by a cozy that says "Betty Ford Clinic Outpatient." Updated: I caught Hogan in a similar pose as Cena above. Update: This post was copied by J-Cena.com and Cena-Everything.com, two fan sites. St. Petersburg is no New York. It's no Los Angeles. It's no Boston. Even so, it has its share of characters who showed up for the first game of the Tampa Bay Rays series against the Boston Red Sox. Resident reality TV star Hulk Hogan, his 20-something girlfriend and another wrestler, John Cena, sat in the luxury box behind yours truly. The Offlede scored some press-level seats for Game 1. They were purchased at a slight discount from a journalist from Clearwater who needed to unload some of the tickets included in his 20-game package. 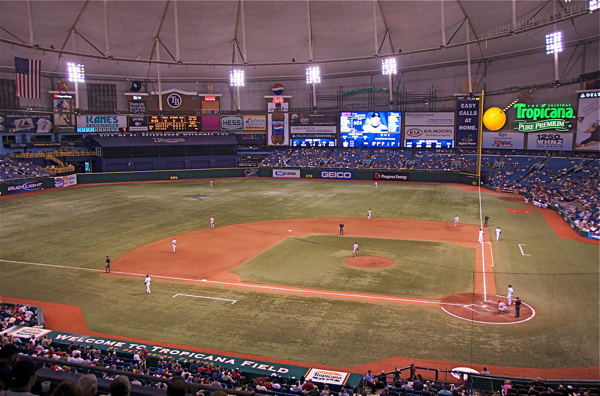 There's something about indoor baseball at a place like Tropicana Field that isn't right: Indeed, a homer by the Sox's Jason Bay hit the ceiling and never came down. That's just wrong. But there's something about sitting in comfortable seats, soaking up the air conditioning and watching replays on big-screen TVs nearby that is just exhilarating. The concessions on the press level were never crowded, though the same ripoff prices were still applicable: 5 bucks for a Pepsi. Ouch. But having celebrities sit behind me dulled that pain. 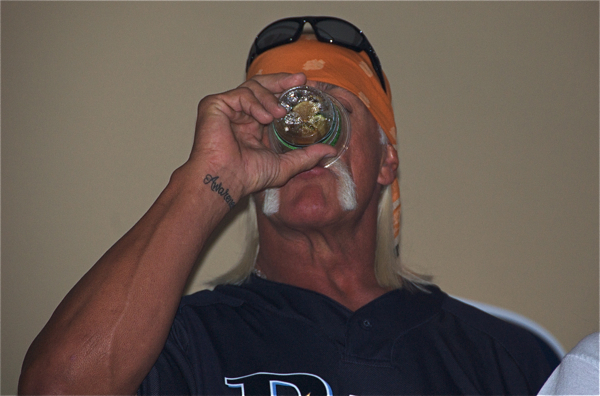 Hogan and his girlfriend canoodled and drank alcohol most of the time. When the Rays hit some home runs later in the game, they clapped a few times. During stretches between innings, I would unknowingly glance behind me. I happened to have a camera in my hands, so I snapped a few shots. Cena chatted up a few young women as he drank a beer with a cozy that said "Betty Ford Clinic Outpatient." I'm sure it's just for decoration, but I seriously wouldn't doubt it. 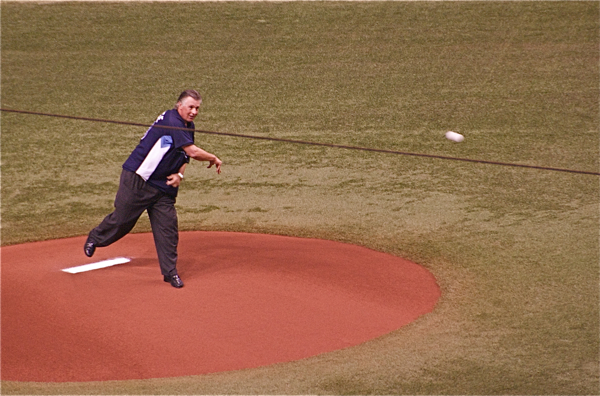 Barry Melrose of hockey fame, currently as the head coach of the Tampa Bay Lightning, threw out the first pitch: a lame dribbler that would embarrass a T-ball player. 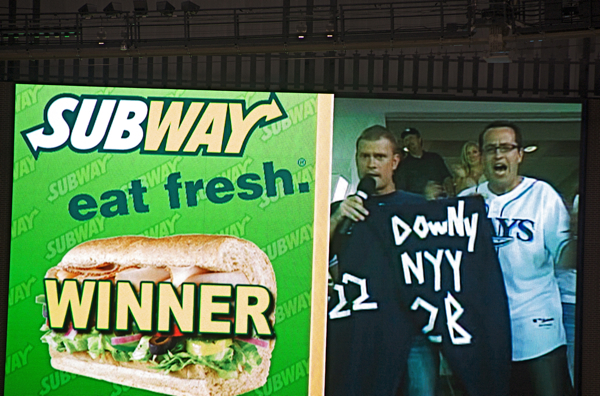 My personal favorite, Jared Fogle, gave away some Subway sandwiches to section 216. I was in 207. I had a Cuban sandwich for dinner anyway, so I wasn't hungry. Meanwhile, there was a baseball game happening. My team, the Sox, nailed homers throughout the game as Boston pitcher Daisuke "Dice-K" Matsuzaka mowed down the Rays hitters with an arsenal of sliders and fastballs. After a Sox batter was hit by a pitch in the first inning, the umpire warned both benches that nonsense would not be tolerated. 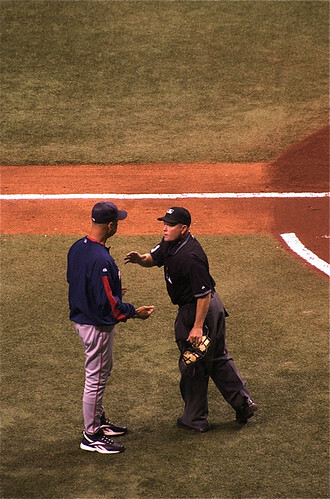 In the vertical photo, umpire Jerry Meals serves up a dish of caution to Sox manager Tito Francona. Of course, the teams have a long history of violence. It's funny: The Sox show their hatred to the Yankees by beating them; they show it to the Rays by beating them up. The only thing I needed to see to make the game complete was an all-out brawl. It didn't happen, but having WWE wrestlers sit behind me somehow made that need go away. Hockey superstar Barry Melrose throws like a hockey player. It's not a puck, Barry: You can't slide it to the plate. To allow fans to get free Subway sandwiches, Jared Fogle answers baseball trivia questions, the answers to which were on the back of a pair of oversize fat-man pants like the ones he wore before his miraculous transformation. 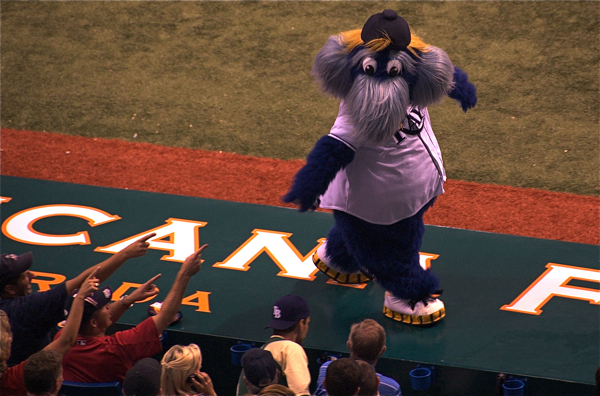 The ugly Rays mascot, Raymond, gets into a pointing contest with Sox fans. 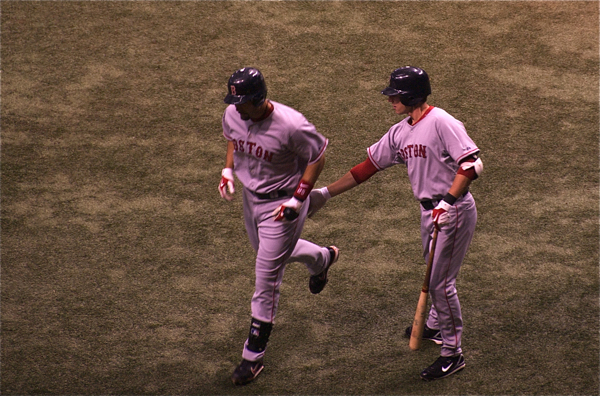 Jacoby Ellsbury violates Jason Varitek after the catcher hit a rare home run. 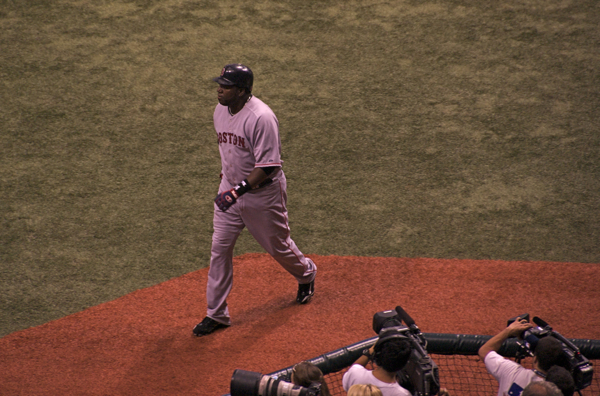 David Ortiz, after a blast of his own, walks by the cameras. My view from the press level. Not bad, eh? 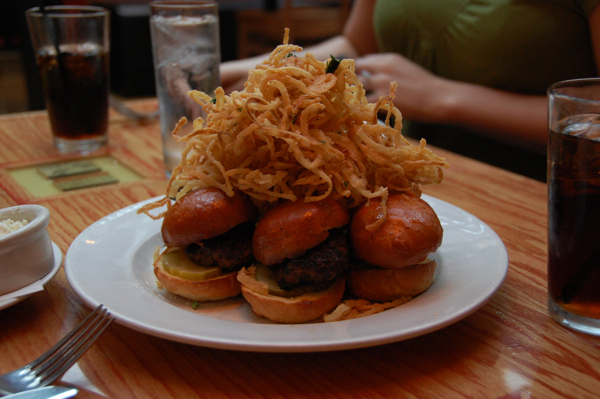 As an appetizer at Matchbox DC, my friends ordered some mini burgers: angus beef on toasted brioche with pickles, onion straws and Gorgonzola, $14. I've never been one to spend an incredible amount of money on food. Look in my refrigerator, and you'd see that it's true. Good food is only enjoyable for the time it's in your mouth - a matter of seconds - and for the time it's leaving your body. The time in between, which is more prolonged, is usually quite unpleasant. I just don't see the need to go broke for something that causes such fleeting pleasure and lengthy discomfort. My culinary frugality carries over to vacationing as well. I traveled recently to Washington, D.C., where I avoided fancy restaurants - for the most part - and hit up the places with the good, classy, cheap eats. 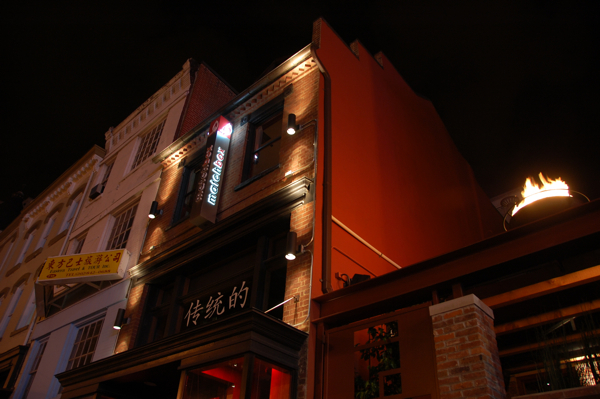 The exterior of Matchbox DC in Chinatown. Matchbox DC is a famous "vintage pizza bistro" on H Street in Chinatown that offers the best brick-oven pies in all of the District. It's a classy place, and there's always a line out the door. When I went with a few friends, we were told we'd be waiting for an hour. But we knew a waitress, and she let us in early. As I've said before, D.C. is all about the people you know. Shooting for something different, I ordered a $12 veggie pizza, less than half of which I was able to consume, leaving leftovers to further stretch my hard-earned dollars. 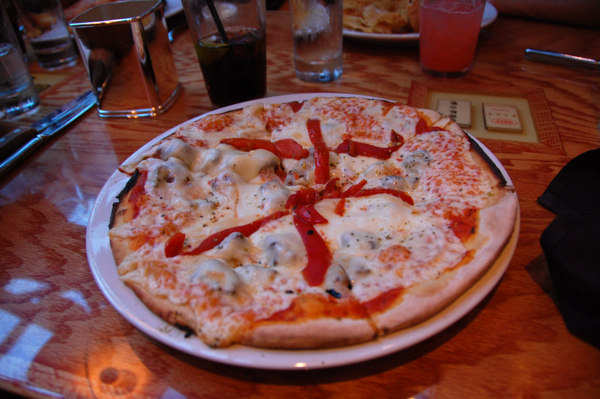 It had sauteed cremini mushrooms, sweet onions, roasted red peppers, a zesty tomato sauce and mozzarella. Usually, I wouldn't be caught dead eating a pizza without meat, but this one was surprisingly meaty on account of the mushrooms. Plus, there's that old adage: less meat, less price. So in the end, it was the smart choice. Besides, I had just eaten from my friends' mini burger plate for an appetizer, so I didn't need more meat. The little cheeseburger from Five Guys with regular fries, $3.49. When you talk about burgers in D.C., you can't go without mentioning Five Guys, which made the nation's capital famous for its greasy goodness. Five Guys is a franchise that started in D.C. but has spread nationwide. According to its Web site, there are 47 of them currently in or coming soon to Florida. But I never have and probably never will chow down on a Five Guys burger anywhere other than D.C. My friend and I - starving out of our minds - made a random trip there around 11 p.m. Mind you, Five Guys excursions usually do come during the late-night hours. The fries are great at this place - especially the Cajun spiced ones - but it's the burger that makes the trip satisfying. 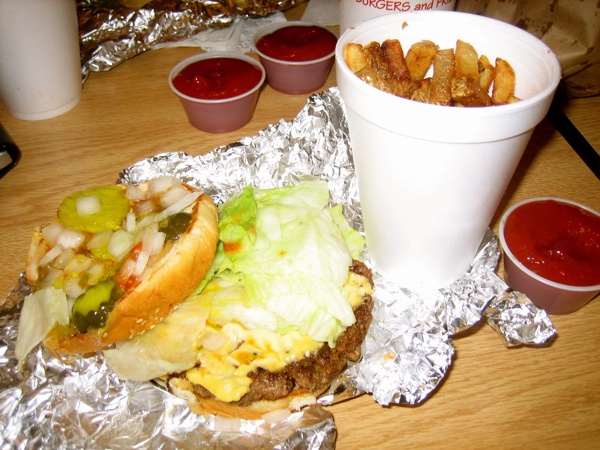 When it comes in a to-go bag, the burger soaks the bottom thoroughly with grease - even though it's wrapped in foil. I got a "little" cheeseburger because the large ones are for serious eaters, and as I said, I'm not one of them. It was only $3.49 for 720 calories, which did wonders for my energy level, eliminating the need for another costly meal later on. And I stole the fries from my friend, so even better for the finances! The outside of a Potbelly location in Chinatown. 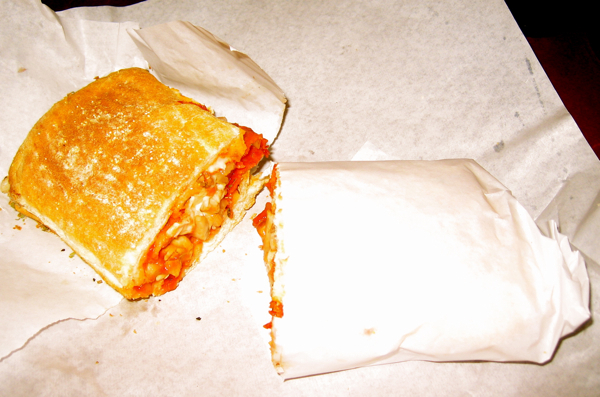 My pizza sub at Potbelly, $4.19. 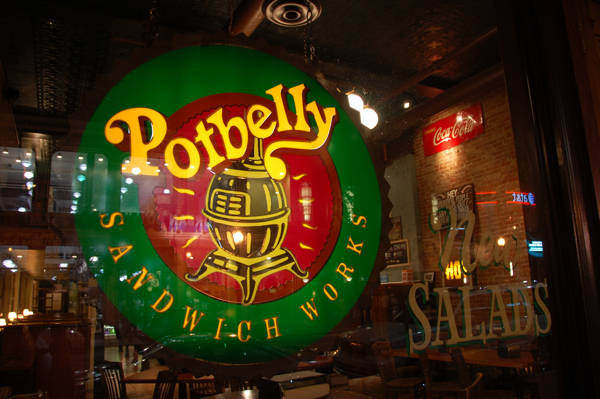 Potbelly Sandwich Works started in Illinois, so it's by no means unique to the District. But because you can't get a Potbelly sandwich south of the Virginia-North Carolina line, I had no choice but to grab one while I was in town. And it's cheap anyway, so why not? The shop is great because, on many days, a live band is playing on an elevated platform in the dining room. When you combine good music with a $4.19 pizza sub, you're getting a lot of bang for your buck. Can't get all that at Quizno's. 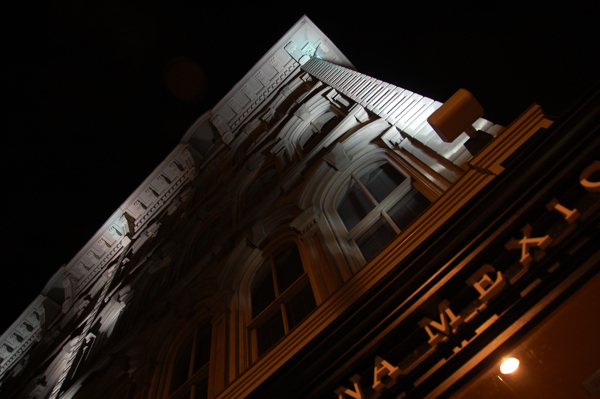 A photo of Oyamel taken the night before I had its catfish. Of course, a trip to a fancy city is pointless without a trip to a fancy restaurant while you're there, right? Not really. Not in my book. But - lucky me - I had the chance to partake in a fine culinary experience for free. A professor whom I still keep close ties with took me to Oyamel Cocina Mexicana, located just off Pennsylvania Avenue in the Penn Quarter. It's not the typical Mexican you get in America: no sugary margaritas here. It's "authentic" ethnic food from Mexico. And it actually tasted more of Spanish cuisine than of anything from south of the border. Most of the dishes were served as tapas, or small servings that combine to make a full meal. Professor and I took a more traditional approach and ordered full entrees for our lunches. I got some catfish on a bun; he got some other kind of meat on a bun. Both came with a salad, chips and salsa. I can't remember what it cost, but it was more than I would spend myself. 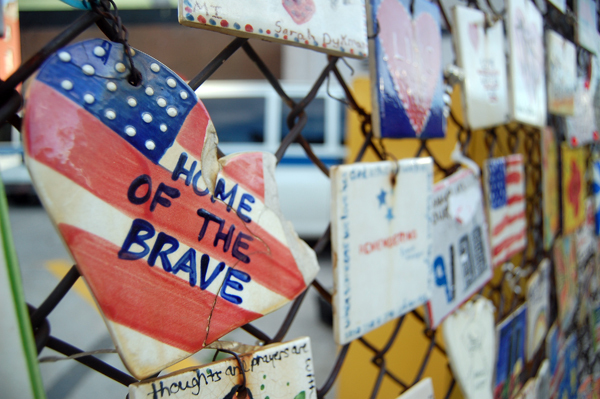 Near Greenwich Village in Manhattan, the "Tiles for America" exhibit honors people who died and pays tribute to a great country that took a big hit on Sept. 11, 2001. I'm not sure if this tile was purposely broken for symbolic reasons or if it just cracked because of weathering. Most everything that has happened this week has been a reminder of how time flies. It was one year ago that I started my current job, a position that has been rewarding at times, frustrating at others. But it has been, most of all, educational, enlightening, satisfying. Having difficulty seeing recently, I went for an eye exam. That made me think of the last time I had a checkup: five years ago. The doctor dilated my pupils, and I had a headache for the following 10 months. I even had to get a CAT scan. This time around, I had them dilated again, and the result? I just can't see anymore. Everything is blurry. And it was seven years ago today that I was in art class during my senior year in high school. I was sitting beside a cute girl, so it was a good day - until my teacher, Mrs. Huwa, walked in and said the World Trade Center was hit by a plane and that the White House was on fire. The superintendent decided to release everyone from class early that day. As we were waiting for a bus ride home, my fellow students asked my history teacher what all this meant. We were attacked, so it surely would lead to war, right? We were mad. We wanted revenge. We wanted war. My end-of-the-year project for that art class was a tribute to those who died on Sept. 11. I thought it was ugly. It was a plaster casting of my own face that was painted in the design of the American flag. I plugged flames into its nostrils, symbolizing the attack. 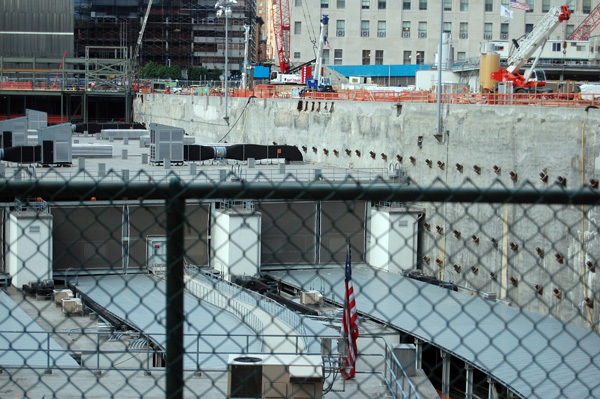 In place of each ear was one of the twin towers. A reflection of the Manhattan skyline was painted onto its eyes. There was a red tear streaking down a white stripe of the flag. It looked awful. But the teachers thought it was cool. The high school bought my masterpiece for $100, and it will forever hang, attached to a plaque bearing my name, on the library wall. It all seems like yesterday. I hope time stops going by so fast. Especially today. Because today, we must pause and remember. 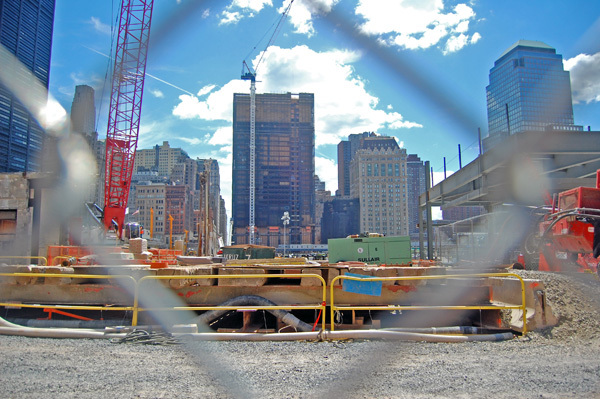 During my internship in New York last summer, I took some photos at ground zero. 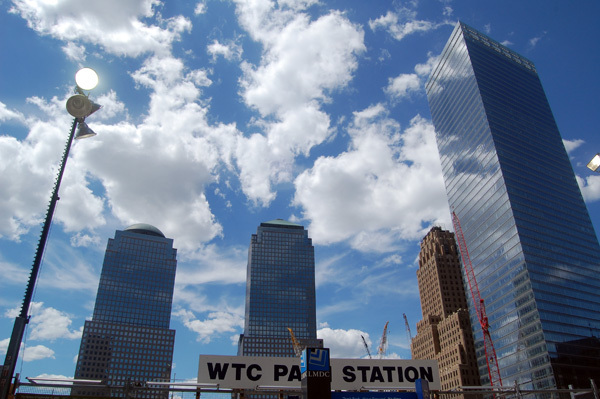 In this one, you can see the newly rebuilt 7 World Trade Center to the right. Directly across the site where the twin towers once stood is the Deutsche Bank Building, where two firefighters died last summer when flames broke out on the 17th floor of the vacant building. Construction of the Freedom Tower recently reached ground level, though you can see in this photo that it was well below that level last summer. 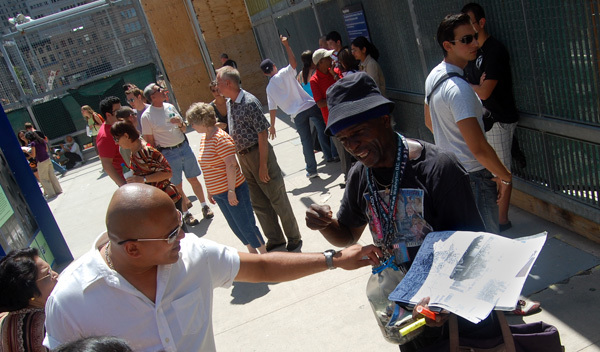 This man is a conspiracy theorist who shouts his ideas to the tourists at ground zero. I think he was saying something about a missile. The bald guy was generous enough to put some cash into his milk jug. There will be many more photos with the upcoming post about the Newseum, the massive First Amendment on D.C.'s Pennsylvania Avenue. I can't tell when I'll have the motivation to write something about my July visit to the Newseum, Washington, D.C.'s shiny tribute to the stuff people talk about. It's not a time issue, really. It's surely a laziness problem I've suffered since returning from my second vacation of the summer, which was in Maine. The next vacation will be early next month. It will entail three days of sightseeing in San Francisco and two days of golfing and vineyard-hopping in Napa Valley. I'm going with a longtime friend and former roommate who is now an energy reporter at The Associated Press in New York City. For now, I'll share this video of the museum, which I edited on the flight to Maine. It really has nothing to do with what I plan to write about, so there's no reason to save it for later. I also have photos, which will go with the main post. Take note of the botched headlines that make up the tiles of the bathroom walls. It's at the end. I will touch on that in the post that's coming soon. I promise! The spread at Susan's Fish & Chips in Portland. 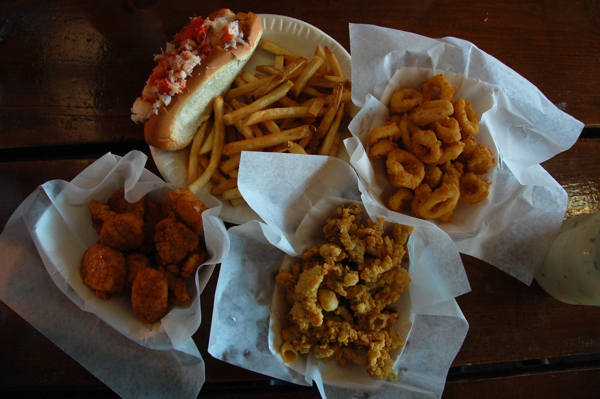 From left, the pint of scallops, pint of clams, pint of calamari, fries and lobster roll. I almost puked - but not because it was bad. I've decided that the only way to describe my attitude toward Florida is a love-hate relationship. 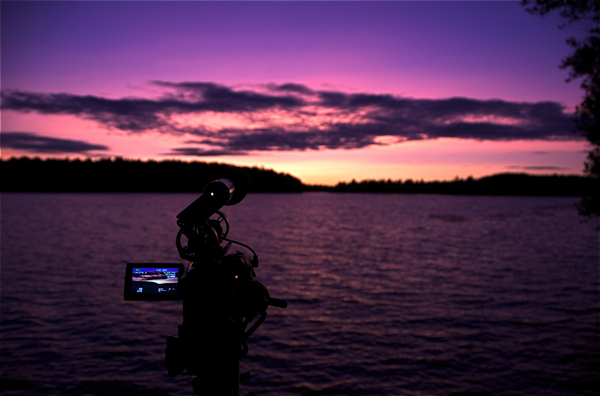 I love its natural beauty - the sunsets and sunrises, when I'm not sleeping or working through them. And for the most part, I love the weather - the warmth, sunshine and lightning. I hate how everything but Walmart shuts down at 8 p.m. I hate the climate's lack of seasons. I hate the sprawling style of urban growth. I'm actually watching the Travel Channel's Samantha Brown as I write this post: She's talking about the "Southern charm" of Winter Park, just outside Orlando. So, I hate its phoniness. But the most unforgivable of Florida's misgivings is its subpar seafood. I'm sorry to say that warm-water fish just doesn't cut it with me. Fish spoils in the warmth, so I guess that explains why Maine's cold-water varieties are so much tastier and meatier. The first thing I had to do during my Maine vacation was grab some fried seafood in some hole-in-the-wall joint. So a friend and I went to Susan's Fish & Chips in Portland, where they had most everything on the menu - calamari, scallops, clams. I had to have it all, so I did - a pint of each, with some fries on the side. My friend, Molly, got the lobster roll, too, but my lobster meal was coming later, so I decided to steal just a few chucks of meat from her roll. The calamari was great, but I wouldn't say Maine is known too widely for its squid. Where the state shines is in its clams and scallops. Having once hated scallops, I tasted the best ever at Susan's and had a bottomless lemonade to wash it all down. But the highlight were the clams. I have never tasted better clams anywhere outside of Maine, and these were some of the best I've ever had. The most unique aspect of the clam experience is the bit of dirt that comes with each deep-fried bite. It's hardiness at its best. I left Susan's full and happy, especially considering I had even more seafood to eat. Red means he's dead, and he's got a potato behind him, which indicates an even greater state of deadness. Having gone through the start of lobster season in Florida before leaving for vacation, I was getting increasingly hungry for a taste of real, Maine lobster. Florida's species, the spiny lobster, lacks one of the largest sources of meat in the Maine variety: the claws. I never had the inclination to pay the $13 a pound for one of the Maine lobsters I see crawling around in a tank at the local Walmart Supercenter in Melbourne. So when I left for Maine and heard that lobster prices were down in New England, it was music to my ears. Juicy lobster meat dripping with butter was surely in my future. But in the Maine supermarkets, it was still $10 a pound. Cheap? I think not. Of course, you can easily pay 10 bucks for a 16-ounce steak, but with lobster, most of the weight you're paying for is the crustacean's inedible shell. It was going to take a better deal to get me to bite. And that came with a trip to the Down East coast. I ran into a seafood market that was basically set up in someone's garage. The freezer was full of haddock, cod and salmon. And there was a large tank swimming with lobsters - with claws, of course. And at $6.50 a pound, I couldn't go wrong. "They're right off the boat this morning," the salesman, who wore rubber overalls, said. I got a 1 1/2-pounder for myself and another for the pops, who always had eaten one for his birthday, but skipped it this year because of the inflated price earlier in the season. Unfortunately, the lobsters were a bit out of season. 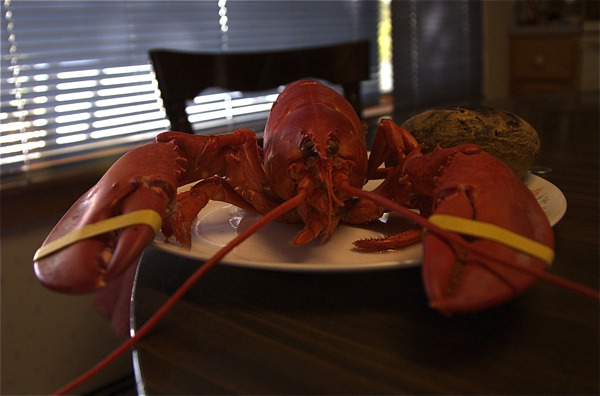 They were technically soft-shell lobsters, though they were quite hard. The most noticeable difference, however, is in the amount of meat: The claws weren't as filled as they could have been. Either way, I got more succulent claw meat than any spiny lobster would ever have. My cell phone camera doesn't do this mound of poutine any justice. 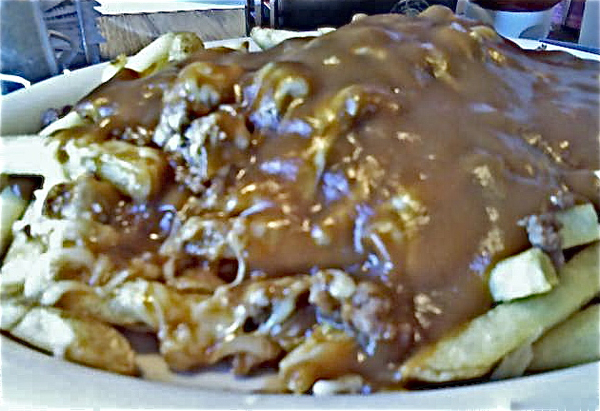 This is probably the thing I miss the most as a Florida resident: poutine, a plate piled with hot french fries, gravy and cheese curd that is popular among French Canadians. The dish is a favorite in Quebec, the Maritime Provinces of Canada and, of course, Maine, which is largely influenced by its neighboring provinces, Quebec and New Brunswick. It's odd, though, that this isn't incredibly popular elsewhere because, well, it just makes sense. What goes better with potatoes than gravy? What goes better with fries than cheese? Putting them together is a no-brainer. My parents and I took my grandparents out to eat to celebrate their 60th anniversary. Everyone else ordered the fish and chips, but I had a plate of poutine as my main course. The fries and beef gravy were smothered with mozzarella instead of cheese curd, but it was good nonetheless. Now that I'm back into my no-poutine routine here in Florida, it's flakes for breakfast and a TV dinner for supper. I miss vacation. This is the closest I could get to the large waves being kicked up by Tropical Storm Hanna. I was only up to my knees when I took this. With Tropical Storm Hanna approaching and creating violent rip currents and surf, the Air Force has closed access to its beaches in Brevard County, which creates a dilemma for me. I have been addicted to going for a swim after taking an early afternoon run. But with the closest beach at Patrick Air Force Base closed, I won't be doing that today. I did go yesterday, however, and I tried an experiment with the camera. It failed miserably, though. I ventured into the water with the camera in hand. I didn't strap it to my neck; in case I fell in, I would be able to hold the camera above the water. I waded in slowly, and the water was only halfway up my shins when a surge came in and I was suddenly up to my chest in sandy ocean water. I planted my feet as firmly as possible into the sand to fight the rip currents from pulling me and my camera down. Fortunately, I won that battle. 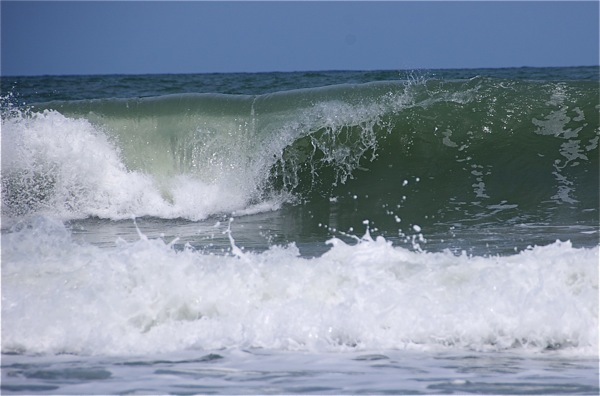 The waves are large, and I thought a close-up photo of a crest would be cool. But as I found out, it's also impossible without a waterproof camera. The beating my camera takes with the salty mist at the beach is enough. I quit while I was ahead and while my camera was still dry. I am, however, investing in some rain-proof sleeves for my camera. That way, I'll be able to take photos during the next hurricane. Hanna will probably affect Brevard, the town in North Carolina, more than Brevard, the county in Florida. But there are two more storms on its trail. It won't be cool if Hurricane Ike hits as a Category 4, but if weaker, it might be a fun time. Its track is uncertain: It could head toward South Florida or scurry up the East Coast like Hanna is doing. My fingers are crossed. Nibbler is no longer in my possession, but I shot one last video of her before she had to go. It's basically to show that she's a good, well-trained guard dog and not the poorly behaving one I described in the earlier libelous post. 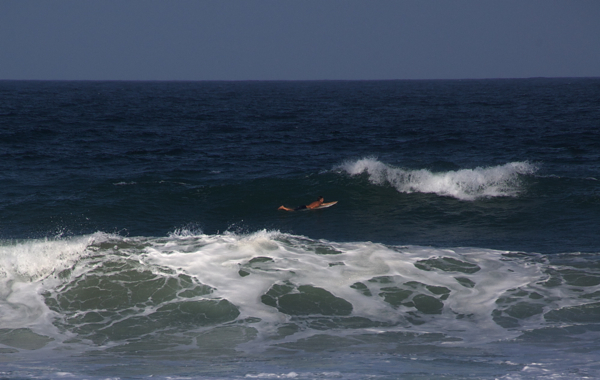 A lone surfer tries to catch one of the waves that are really being kicked up by Hurricane Hanna. 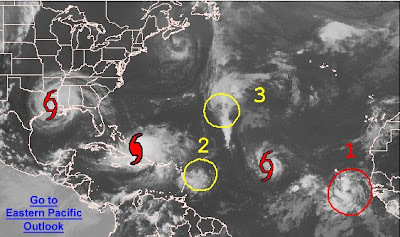 The tropics are really heating up now, as you can tell from the satellite image to the left. Both Hanna and Ike seem to be on similar paths that would take them just off Florida's east coast. We may get clipped by something here in Brevard County, but it looks like I'll have to wait a little longer to get my hurricane. Meanwhile, people keep calling me crazy that I actually want to see one.